"Yes, This picture is totally done with recycled paper and a rescued frame. The flowers have the look of straw flowers. They are made from recycled magazine pages and scraps of paper from previous projects. The colors are shades of yellows, browns and purple. I love the look and color of the magazine flowers. The background is handmade paper with flecks of flowers and such mixed in. There is a cute purple butterfly made with a paper magazine bead body. The frame is 7 13/16" x 5 13/16. Cute little picture for the kitchen or bath or any little corner you want to add some color to." Thanks Joan for some great recycled quilled art. 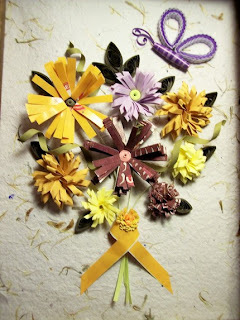 Since my real craft passion is quilling I wanted to pass this along. Make sure to visit her store and her website too! Stop by my other site and see more recycled projects! 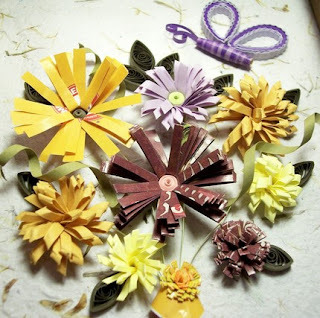 Monica, Thank you soooo much for featuring my recycled project!